The new minor in digital studies is designed to equip undergraduate students from many different degree majors with digital computing, design, and communication skills. 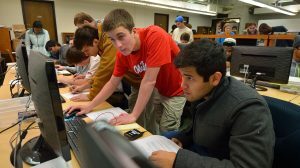 The University of Mississippi will offer a new interdisciplinary minor in digital studies designed to equip undergraduate students from many different degree majors with digital computing, design and communication skills to complement their main academic focus. The new minor, offered beginning in fall 2016, will be housed and administered in the College of Liberal Arts’ Department of Writing and Rhetoric. Robert Cummings, chair and associate professor of writing and rhetoric, will serve as director of the minor. Faculty members affiliated with the program will meet periodically to consider changes to the curriculum and assist in the advising process. The College of Liberal Arts,School of Engineering and the Meek School of Journalism and New Media jointly proposed the undergraduate minor. Faculty from across academic programs, UM Libraries and Information Technology met to formulate the proposal and flesh out the courses to be included. The DMS minor aims to teach students basic web authoring and programming skills, how to critically evaluate digital information and also how to apply digital skills and expertise in multiple fields. Students will take 18 credit hours, which includes six hours of core classes. They choose the remaining 12 hours from an approved list of options. The minor includes four emphases from which to choose: computing, digital communications, digital arts or a generalist track. The emphases have different, but connected paths of digital technology and problem-solving, according to the developers of the course. Richard Forgette, senior associate dean of liberal arts and professor of political science, played a major role in the development of the program. He said there was wide interest from the student body.